We saddled our horses one July morning in Yankton, SD. The temperature was 90°F with 90% humidity. We looked at each other and asked if it could really be that much hotter in the South where they don’t have the long, brutal winters? 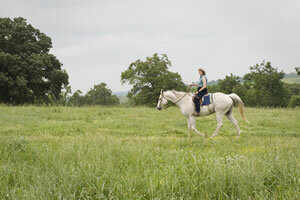 The following fall, Doc was offered a job at a veterinary practice in the foothills of the beautiful Ozark mountains. At our first New Year’s Eve party, Tom was talking about wearing out a tractor mounted snow blower. When he was asked “what’s a snowblower?”, we knew we had arrived. In 1984, our local bank was soon to be repossessing a place and all we had to do was take over the payments. It seemed like a good way to start, but the only problem was that there wasn’t a house. We decided to rough it in a garage until we could build a house. After 2 winters, we vowed no more and finally built a one bedroom house. 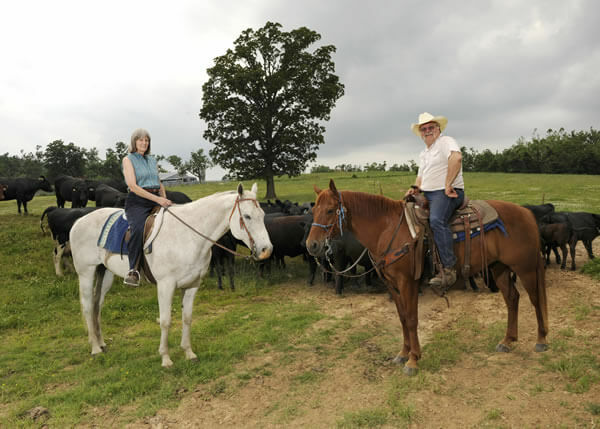 We made new friends at Ozark Angus and bought our first registered Angus cow at their production sale. 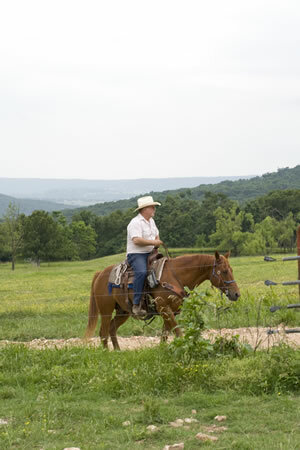 Doc had studied the “new” non-surgical embryo transfer technique and the Sugar Springs herd soon multiplied. New genetics were added from the B&L dispersion in Oklahoma. Over 20 years of exclusive use of embryo transfer and artificial insemination have resulted in an elite herd emphasizing fertility and functionality balanced with feed efficiency and carcass traits. Today we have a select group of females that are the core of our herd. To promote our herd, we started showing our cattle at local and state shows. We were interested to see how our cattle looked when compared to other breeders. Our first major show was taking our first bull to Denver in 1994 to the National Western Bull Show and Sale. We were awarded a Reserve Division championship and sold him to an Angus breeder in Mexico. Since then, we have had many champions and continue to strive to produce good females. Several of our heifers have been shown successfully by juniors across the nation. We have actively supported the junior Angus programs by our purchase of Davis Forever Lady 2244 in Louisville as well as the pick of the Van Dyke Angus herd VDAR ELUNA 3710. In addition, we donated the Arkansas foundation heifer which raised $10,000 for the juniors.